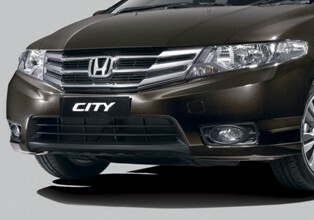 Honda Malaysia has just launched the new face-lifted and widely popular Honda City. It now comes with 2 trim levels which are the Honda City S and E versions respectively. It is powered up with the 1.5 liter iVTEC engine mated with a 5 speed automatic transmission gearbox which is very much the same as the previous model. As with most face-lifted models, the City is covered with some minor changes on its look where it now has new bumpers both in front and behind as well as new designs on the chrome grille and rear lights. The Honda City S, which is the entry level model is priced at RM85,980 while the E version is priced at RM90,980 on-the-road with insurance and they come with a 5 year unlimited mileage warranty and 6 free labour services. If you want more, you can also opt for the RM2,950 Modulo body kit that gives it a more sporty look while for RM3,660 you can get the Connex SVR which is their own stolen vehicle recovery system. The face-lifted City also comes with a new dashboard design while safety features include 2 airbags in front, ISOFIX, ABS and EBD among others while you also get paddle shifters, a leather wrapped steering wheel as well as an optional navigation system.